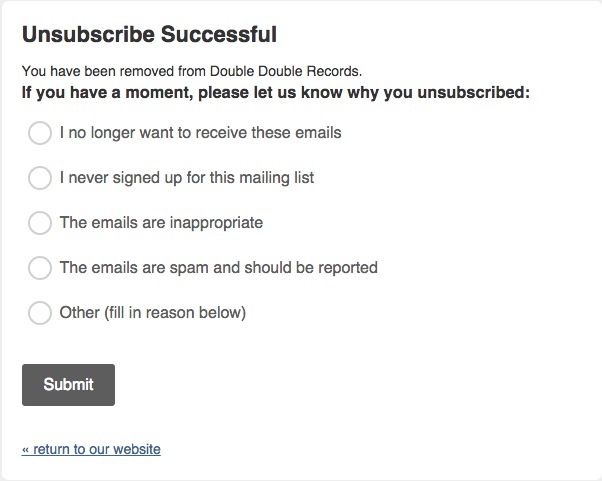 The Unsubscribe success page includes an unsubscribe reason survey where subscribers can tell you why they don't want to receive your content anymore. Survey results are available in campaign reports. In this article, you'll learn how to view, edit, and remove the unsubscribe reason survey. To view and edit the unsubscribe reason survey, follow these steps. 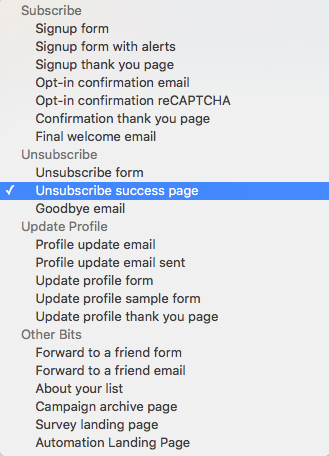 Click the Forms and response emails drop-down menu and choose Unsubscribe success page. We'll show you what your Unsubscribe success page looks like, and if the unsubscribe reason survey is active, you'll see it displayed here. Although the survey appears each time someone unsubscribes from your marketing, they are not required to fill it out. To change the reasons that appear on the survey, navigate to your audience's Form Builder. 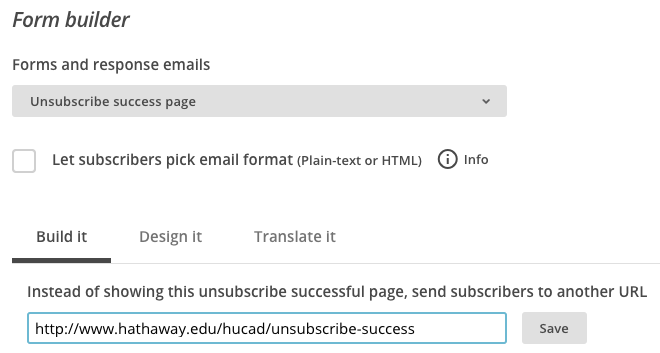 Choose the Unsubscribe success page from the drop-down menu, and click the Translate it tab to edit the text for each option. You cannot add or remove reasons. 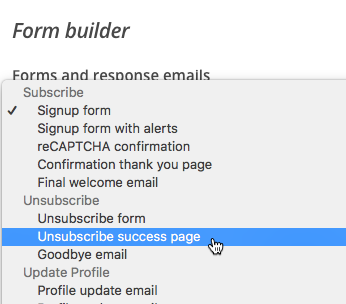 If you don't want an unsubscribe survey, you'll need to redirect users to a custom Unsubscribe Success page on your website. First, create a page on your website that tells users they have been successfully unsubscribed from your marketing. Then, to set a redirect URL for your Unsubscribe Success Page, follow these steps. In the Instead of showing this thank you page, send subscribers to another URL field, input the URL for the unsubscribe success page you created on your website. Now when recipients click the unsubscribe link, they'll arrive at the URL you set on this page, which doesn't contain the unsubscribe reason survey. If you have the unsubscribe reason survey enabled, subscribers will receive a poll after they unsubscribe from your list. Learn where to view the responses.